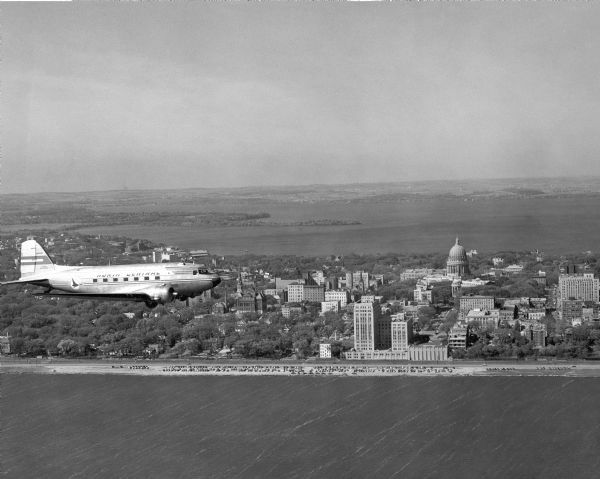 Aerial view of a North Central Airlines DC-3 airplane flying over the Madison isthmus. Clearly visible are the Wisconsin State Capitol, the 1 West Wilson Street State Office Building, and Lakes Monona and Mendota. The DC-3, introduced by Douglas in 1936, was one of the most important planes in the history of the modern airline industry. Accomodating over 20 passengers, the DC-3 freed commerical airlines from their dependence on airmail contracts, and it did much to popularize air travel among the general public. During World War II the military equivalent of the DC-3 was an important transport plane. It is likely that the DC-3 in the photograph was acquired as military surplus. Originally incorporated in Clintonville as Wisconsin Central Airlines in 1944, by 1952--the date of this picture--the company had moved from Madison to Minneapolis and changed its name to North Central Airlines.